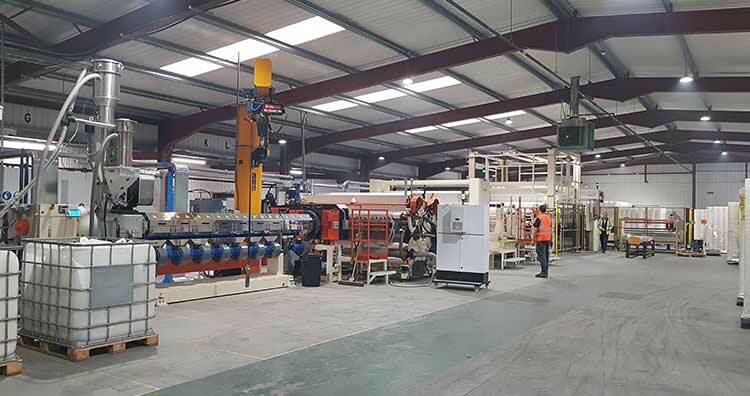 Wykamol have invested in a multi million pound investment, in a new factory and manufacturing plant to make waterproofing membranes in the UK , this is a first in the industry, making Type c cavity drain membranes, and shows how our manufacturer members are investing in the waterproofing sector. The factory is the second plant opened by Wykamol and is over 23.000 square feet of space to manufacturer and store their waterproofing products. Key to the project was sourcing a site with enough power to run the machine and the extra storage space for growth into this sector. In the photo you can see the scale of the machine , which is over 60 metres in length and is capable of running 24 hours a day. This is the second investment by the group as 18 months ago they invested in a powder bagging plant to manufacture cement based products for the waterproofing and renovation sector.